Just popping in quickly to say hello and have a little catch-up. I've been struck by my bacterial nemesis - tonsillitis - and have spent most of the week sleeping, taking medication (some of which I was allergic to), watching Netflix (Dexter!!!) and generally feeling sorry for myself. I've spent very little of the week knitting, eating, or blogging. If I'd been here yesterday I'd have told you that there's a new hexipuff knitalong on Instagram which prompted another little binge before I got sick. 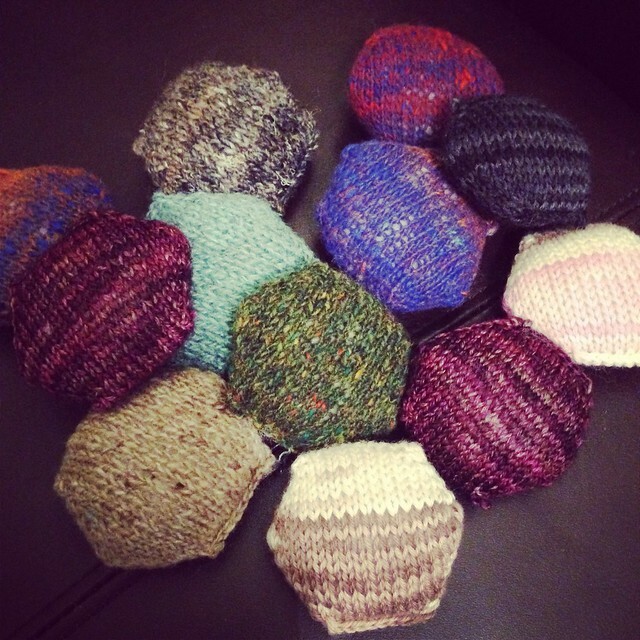 If you'd like to join in, post your pics on IG and tag them with #hexipuffkal2014. If I'd been here you would also know that I finished the neon pink thing for Little Miss... but I haven't taken any pictures yet. It's on the (long) list of things to do. Yesterday I'd also have told you that I started the first book in the Outlander series. At 30% I'm not really loving it so far but am persevering (a) because SO MANY people have recommended it and (b) because I paid full price for it and I usually buy novels that are on offer! The jury is definitely out on this one at the moment, but I'm hoping it'll improve soon. Finally, thanks to the spinners who have already contacted me to be a part of the 'Spinning Show & Tell' guest post series this year. If you missed the shout-out, you can find it here. That book is titled differently in the UK. I heard the hype too. I made myself finish it. It's more historical than romance. I won't be reading the rest of the series. Oh no hope you feel better soon! Hexipuffs occupy the nr 1 space on my list of must make projects, but I don't knit (yet!!!) and the single crochet stitch ones I have seen thus far is not quite as gorgeous. I'll see . . .
With the latest booksshe got bogged dow in detail, but oh, the Story. Read on. I started watching Dexter while I stitch, so far I'm really liking it! I love those hexipuffs! I've been making English paper piece hexagons for a quilt and I am addicted! Sorry to hear you're not well. Hope you are feeling better.